Entering the wonderful world of recovery can come with a whole new set of terms and concepts that may seem foreign, or are easily misunderstood. Oftentimes it takes repeated exposure before a workable definition can be formulated. One of the first tools presented on this journey will typically have something to do with setting boundaries in recovery. 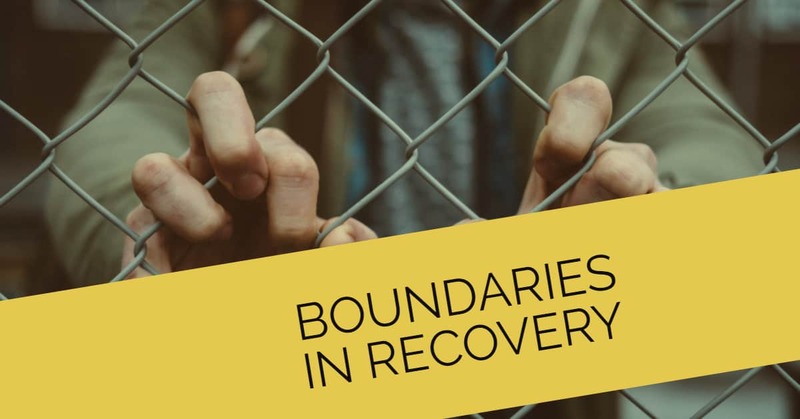 Therapists, fellow members of recovery programs, and families lost in the addiction are counseled to “establish firm boundaries,” but what exactly does that mean? What are Boundaries in Recovery? Early in the process it can be frustrating to figure out what a boundary is, how to create boundaries that will be effective, and most importantly, how to reinforce our boundaries when they are threatened or violated. Like any new skill, it may take several clumsy but well-meaning attempts before we begin to learn how to apply even the most basic principles. The important thing to remember is, as with any skill, the more we practice, the easier it gets and the more proficient we become. “Boundaries are meant to protect us from their monster within.” Before we can go about establishing healthy boundaries with our loved ones who are battling addiction, we must first accept this difficult truth: the person we love has been consumed by an alien force which has taken control of their minds and robbed them of their connection with us. It helps to remember the story of Dr. Jekyll and Mr. Hyde, the famous novel that metaphorically describes the effects of this disease on our humanity. When we realize that boundaries in recovery are meant to protect us from their monster within, and are not a punishment for our friend or family member, our actions can become much more deliberate and intentional. A common misconception, which often goes unchallenged, relates to the idea that boundaries are meant to somehow teach a lesson to the one with the addiction. We mistakenly believe that the more harsh our consequences and the more strict our expectations, the more they will see how serious we are and “snap out of it.” It doesn’t take long to realize that, sadly, the monster which is controlling them has no interest in learning anything from us at all. Therefore, our efforts must be turned towards protecting ourselves and those in the path of their destruction. “Do not try to go about establishing boundaries on your own for the first time.” If there was a deadly animal on the loose that was devouring the neighborhood pets and threatening young children, we would not think twice about building strong fences and barriers to protect those we have stewardship over. We would not attempt to train the wild animal not to harm us, but would rather do what we could to eradicate the threat at all costs, while ensuring our safety in the process. Boundaries are best understood from this perspective. We do everything we can in an effort to make sure that our energy resources are maintained, that our healthy connections are safe, and that we have enough to give to those who are looking to us for guidance and strength. If we spent all of our time trying to stop the behavior of the attacker, we leave that which we are trying to protect even more vulnerable. Likewise, we must find a way to detach ourselves from the crippling consequences this disease ravages on its host, while maintaining a safe distance to support the one we love who is trapped inside, never losing hope that they will find their way out…but until they do, we must fortify our existing resources. :”They may use manipulation, guilt, and shame to weaken resolve and maintain their illusion of power.” The most unexpected and difficult aspects of assimilating boundaries into relationships comes when they are not respected or are even blatantly disregarded by those who need treatment. Initial efforts may be mocked and seen as just another vain attempt to control them. One must be prepared to accept that the more dedicated and consistent we are about upholding our boundaries, the more violent and dramatic the pushback tends to be. Addicted human beings have a tendency to resist healthy change and will fight hard to ensure that their dysfunctional cycles and patterns are allowed to perpetuate. They may use manipulation, guilt, and shame to weaken resolve and maintain their illusion of power. It is during these moments that most friends or family will give in and figure the effort is not worth the trouble. Unfortunately, surrendering to the constant buffeting may seem to be an easy way out, but it is part of what allows an addiction to flourish. If we allow these dramatic presentations to deter us from our own goals of health, safety and stability, we never get to realize the freedom which often comes at the very moment when all seems to be lost. With addiction thrown into a relationship, many of the previous patterns of interaction with family members or friends tend to evolve into a toxic mess, which creates more of the pain we are striving to avoid. Difficult as it is to do, there must be a drastic shift away from what feels ‘right’ to a more counterintuitive relationship with our struggling loved one. What could be seen as helping a person who does not have an addiction, soon creates a troubling situation when poisoned by the dysfunction. Trying to maintain old patterns can become an enabling factor that feeds the illness and secures it’s resolve. Again, when compared to the wild animal in the neighborhood, we would not attempt to feed it our own pet, expecting to reduce the chances of another’s pet going missing. If you find yourself struggling with these concepts or not quite knowing where to start, reach out to a solid recovery program or therapist that specializes in addiction and codependency. Understanding how our well-meaning actions have kept the monster alive is the only way we can educate ourselves enough to neutralize the unhealthy aspects of a relationship. Boundaries can be the most empathetic and loving move we can make, not only to those we are trying to help, but for ourselves. Do not try to go about establishing boundaries in recovery on your own for the first time. Let those who specialize in this deadly disease guide you through the process until you feel comfortable enough to stand on your own. For more information help on this topic please feel free to contact us.